Victoire Charpentier guides the reader into her world of Revolutionary France…and this is no one else’s world—it is uniquely a product of her station in life and forces that shape her future. Hers is a humble, yet strong and powerful, voice, a feminist voice in a time of revolution and female suppression. It is a story of betrayal and loss; suffering and anguish, yet also good fortune and reunion—a bittersweet, multilayered tale that will touch your heart. Born of humble peasant roots in Lucie-sur-Vionne, Victoire’s innocence was shattered when her father is carelessly and recklessly killed by an uncaring nobleman…when she is sent into domestic work in another nobleman’s house, she is vilely used and forced to abandon her own beating heart. The tragedies continue to accumulate until she is arrested and forced into the notorious La Salpêtrière asylum for “insane and incurable women” (Invention of Hysteria, Georges Didi-Huberman). The book vividly depicts the violent and inhumane methods doctors used to “treat” mental illness in women (or simply melancholia, perhaps not even mental illnesses at all) at Salpêtrière. To me, this was perhaps the most fascinating portion of the story- descriptions of the appalling conditions under which the women were kept, the rivalries that developed among cell mates, the rules one had to learn in order to survive this prison. The narrative was stark and believable and, believe it or not, educational. Since I’ve finished the book, I’ve been looking up the history of the Salpêtrière Hospital, intrigued at how low mental health care and the care of women had deteriorated at that time. 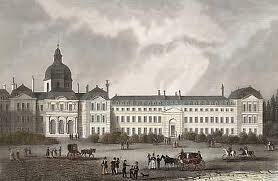 Introducing an urge to learn more, dear readers, is the mark of excellent historical fiction. There she meets Jeanne de Valois-Saint-Rémy—author of the infamous Necklace Affair that brought down Queen Marie Antoinette. Victoire is intimately involved in the by-products of this affair, and her fortunes finally begin to look up. In her new life outside the asylum, she becomes actively involved in the politics of the Revolution and is swept up in the hysteria of the Bastille storming of 1789. 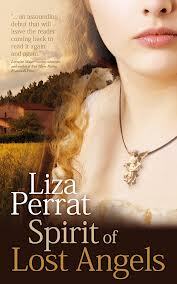 Liza Perrat persuasively combines fact and fiction in this engrossing novel. The peasants’ fury, the passion building up to the Bastille storming, and the sense of political explosion are just a few of the vivid illustrations of this in Spirit of Lost Angels. Although immersing oneself in Victoire’s tragedies can at times be unsettling, don’t miss this book. It is an impressive example of well-crafted historical fiction as well as being a professionally published Indie novel. Very impressive indeed. Highly recommended. DISCLAIMER: I received a review copy of Spirit of Lost Angels from the author, in exchange for an honest and fair review. oh for god’s sake. It isn’t “by” Michelle…, it isn’t even “by” Michel…It is a collection of Q. and A. among a number of French luminaries and MF. Thank you for the lead and I hope you are enjoying the book…You are very fortunate to be living in snowy Vermont. I am sure if I lived there, this blog would have many more posts!